Helsinki, Finland is a World Design Capital and UNESCO Creative City, a must-see design destination for the creative traveler. Helsinki’s siren call to creatives around the world has distinguished the city as a UNESCO 2012 World Design Capital and a UNESCO Creative City. Lux Helsinki Lights up buildings through the city. The festival is free and open to the public. 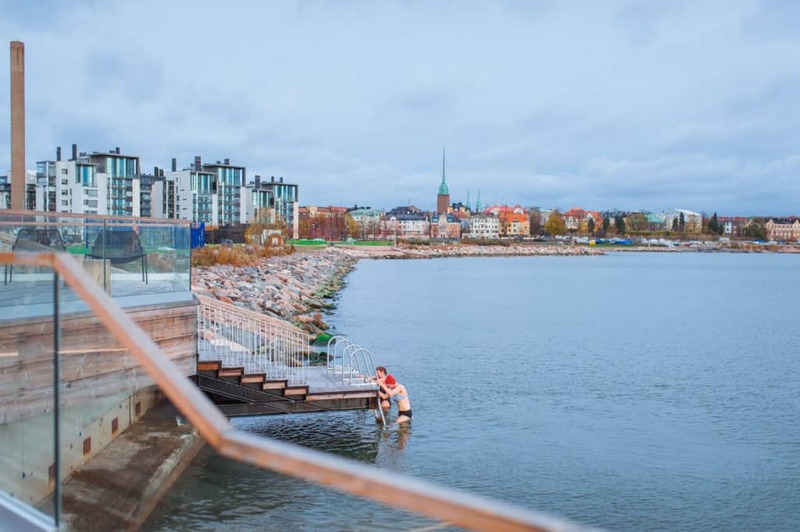 Design runs deep in Helsinki’s DNA perhaps emboldened by Finland’s sauna culture which serves as a defacto coffeehouse tete-a-tete or perhaps it’s the majesty of mother nature that endows the city inspiring vistas of green spaces, forests and the Baltic sea. Modernist master Alvar Aalto, Finland’s most famous architect, helped shape Helsinki’s cityscape with 14 iconic buildings all while building the design brand Artek. Finlandia Hall in Helsinki, designed by Alvar Aalto. For Alvar Aalto fans Finlandia Hall is modernist must-see. The concert and events hall captures the essence of Aalto’s humanistic approach to modernism—a mixture of organic resources, self-expression and fresh progression. Aalto’s prolific fifty-year career in Helsinki produced many pieces of furniture and decorative items emblematic of midcentury modernism. 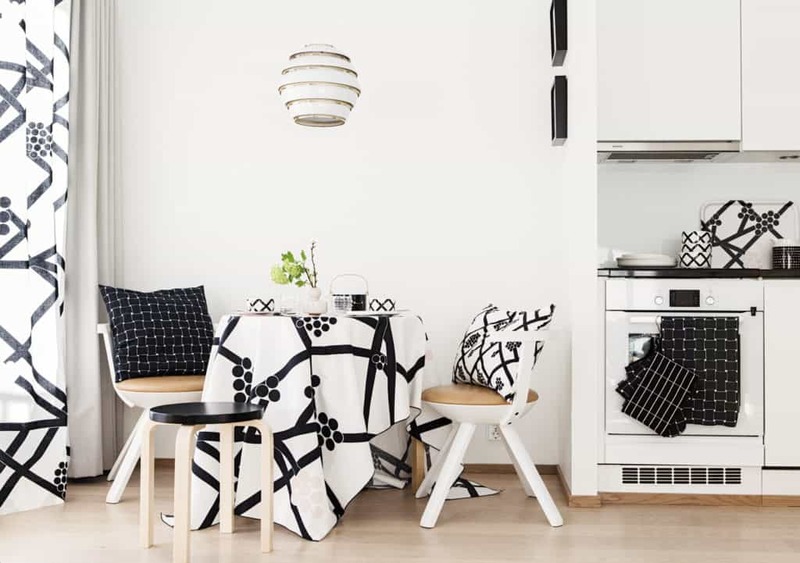 Marimekko textiles and Artek kitchen furniture. 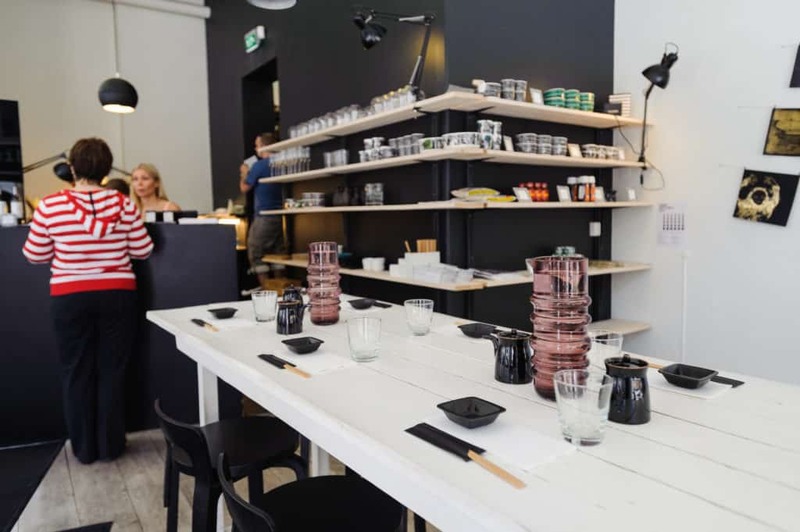 The city is also the cradle of beloved Finnish design brands Artek, Marimekko and Iittala, whose products are commonplace in Helsinki homes. 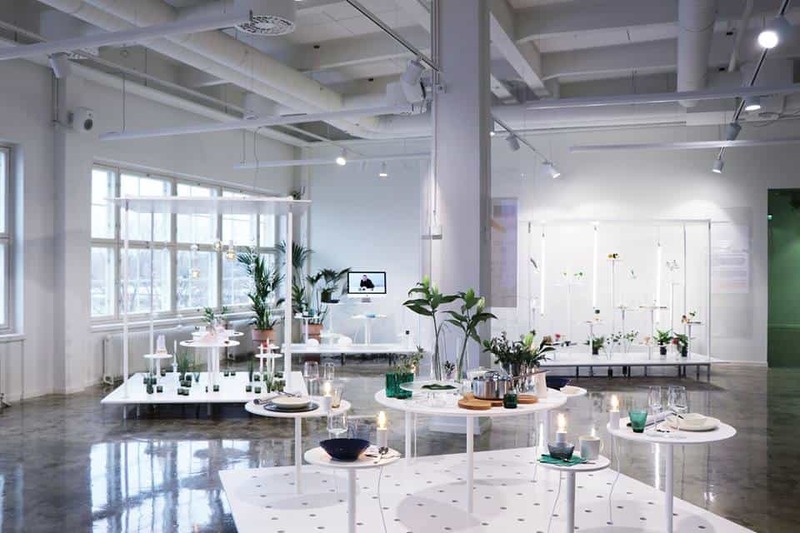 Iittala Lounge at the Design Center in Helsinki Shows some of the iconic tableware. Established by the King of Sweden as a trading town with Russia in 1550, Helsinki for 700 years belonged to Sweden until the Russian Republic claimed it. Finland gained its independence 100 years ago from Russia and has spent most of 2017 celebrating the centenary of Finnish independence. 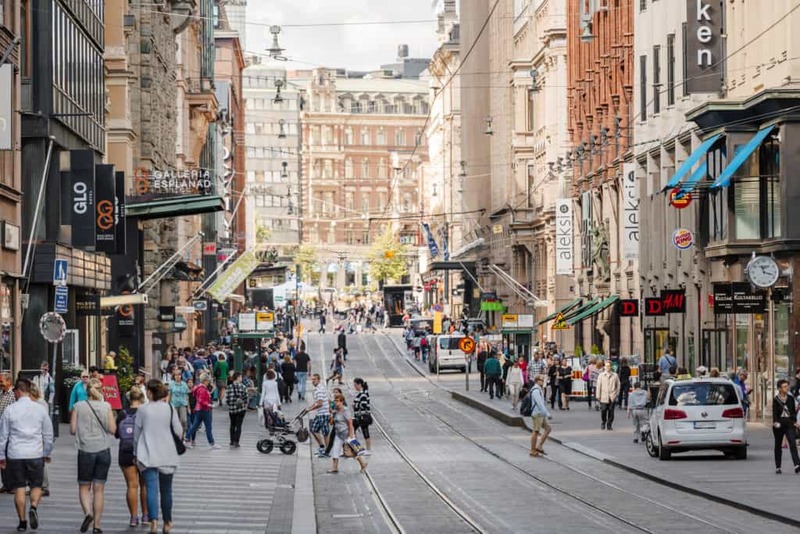 Helsinki’s population numbers more than half a million and most locals don’t see themselves as Scandinavian (grouped in with natives of Sweden, Norway or Denmark). The Finns speak their own language that defies categorization. 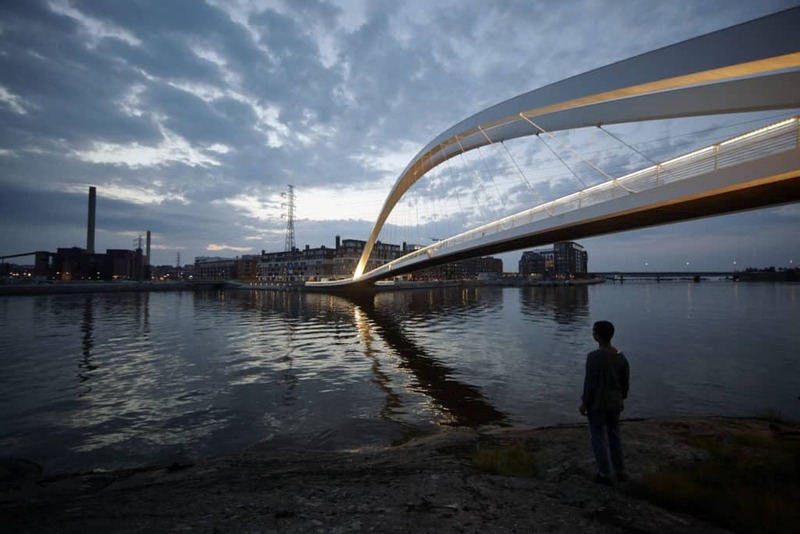 Isoisänsilta (“Grandpa’s”) Bridge in the evening light is an architectural sight to behold in Helsinki. As a Design Tourist, Helsinki is a must-see for its architecture, design and creative culture. Whether you choose to travel during the city’s long summer days or longer winter nights, there is much to discover and experience for curious, creative minds. The K Klaus Hotel is one of Helsinki’s finest design hotels with authentic accommodations that draw from local folklore. 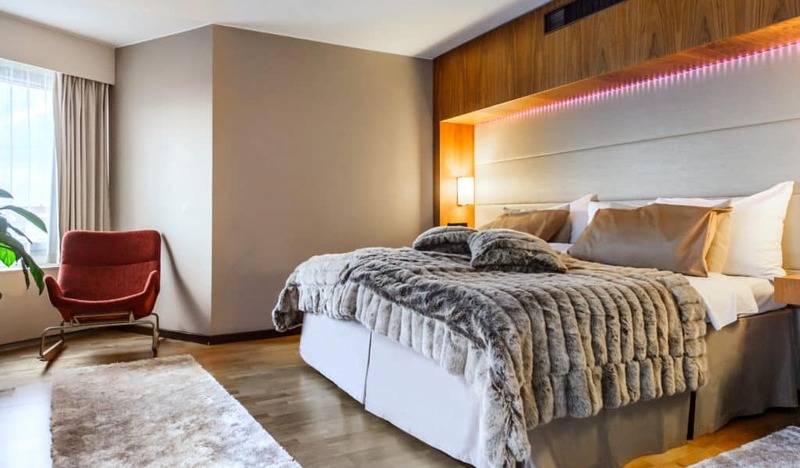 Stay in style at the Klaus K Hotel, located in the city center in an old Art Nouveau building with interiors inspired by Finnish folklore. Each hotel room is uniquely created in collaboration with some of Finland’s most famous contemporary artists. Stylish room in the K Klaus Hotel, one of Helsinki’s notable design hotels. Each designer room is unique and created in collaboration with some of the most famous Finnish contemporary artists. 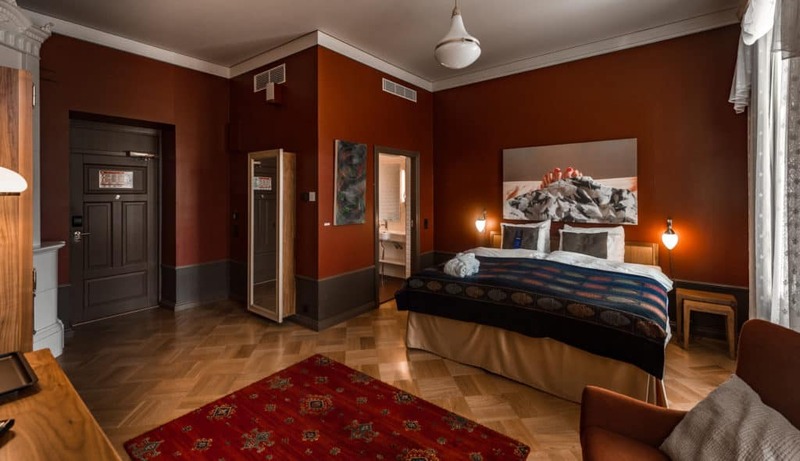 I particularly like the massive custom headboards that command entire walls in each of the rooms and the playful references to Kalevala lore. Helsinki Design District. While at the Design District, pop into the Design Museum and tour the permanent collection of Finnish design from the late 19th century to today. The 140-year-old museum also presents special exhibitions on the latest trends in Finnish, Scandinavian and international design. 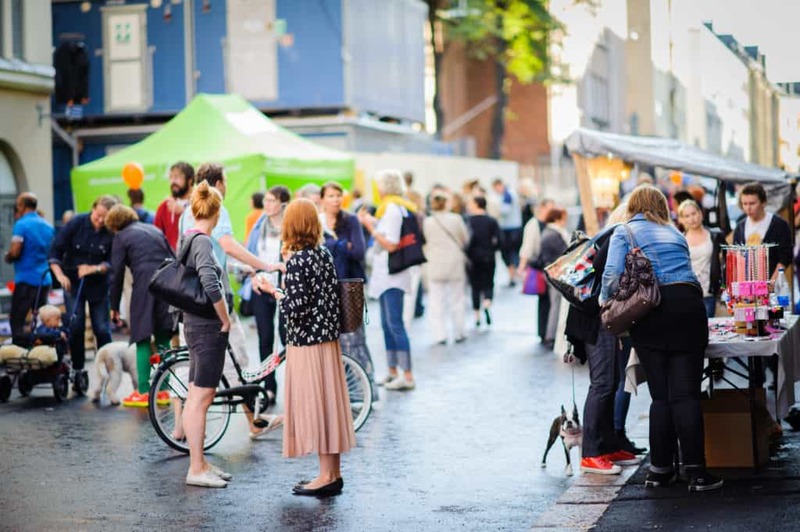 The Helsinki Design District is a deep dive into Finnish design and shopping. Located in the center of Helsinki, this cluster of more than 200 creative businesses spans 25 streets and includes design and antique shops, fashion stores, museums, art galleries, restaurants and showrooms. The district is divided into themed walkable routes for design enthusiasts. 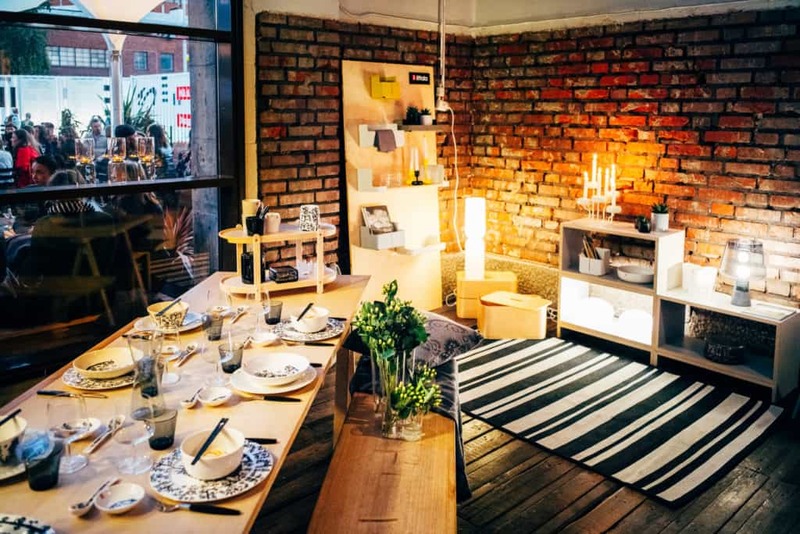 One of the many maker and artisan shops in Helsinki’s Design District. Next, walk over to the Museum of Finnish Architecture in the middle of the Design District, Finland’s only architecture museum. 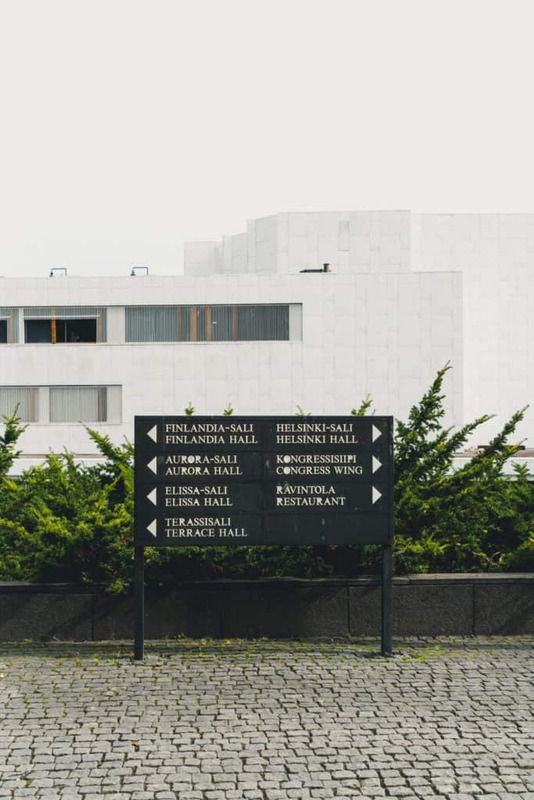 Founded in 1956 and housed in a neo-Renaissance edifice, the museum features Finnish and international touring exhibitions, a permanent exhibition on 19th century Finnish Architecture and architecture walking tours of the city. 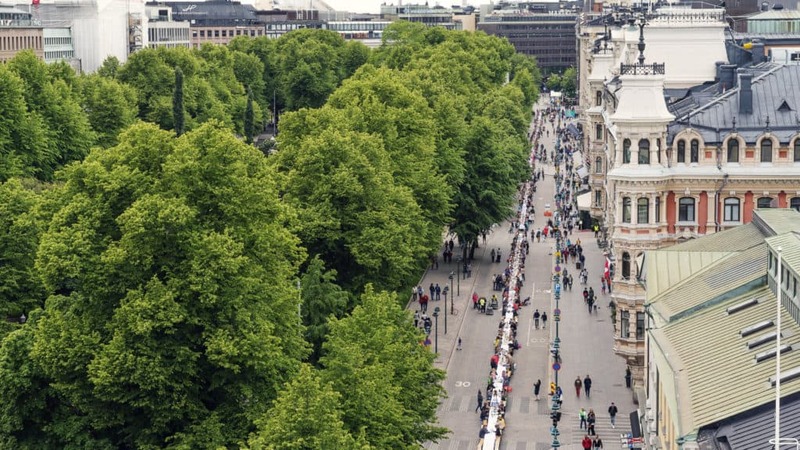 The Esplanade, Helsinki’s main grand boulevard connecting much of the central part of the city, offers upscale stores and flagship stores of Finland’s most beloved brands including Artek, Marimekko and Iittala. The promenade runs through the central part of the city ending at the harbor area. The Arabia district is another haven for design lovers that centers around the Arabia ceramics factory dating back to 1873. 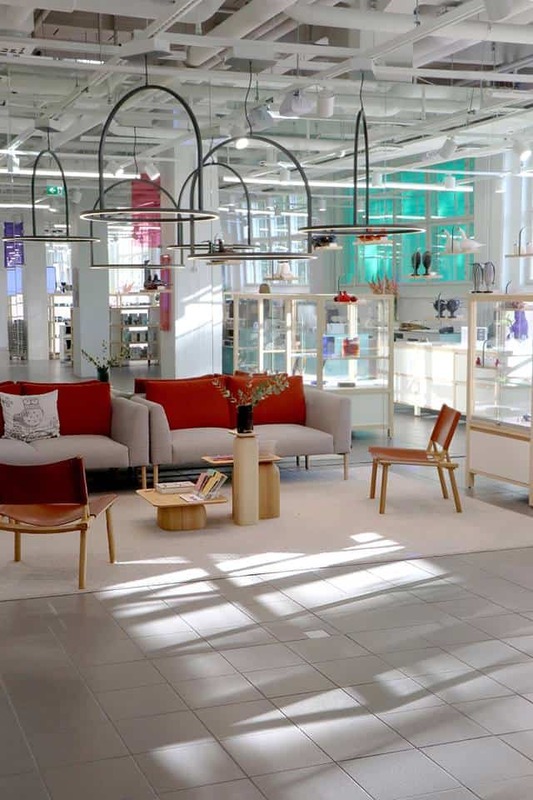 While there, visit The Iittala & Arabia Design Center and tour the Design Museum Arabia and the Design Lab housing studios of working artists. Another design hot spot is the Tori Quarters, between the Market Square and Senate Square, populated with neoclassical buildings that house artisanal shops showcasing a variety of handmade products. 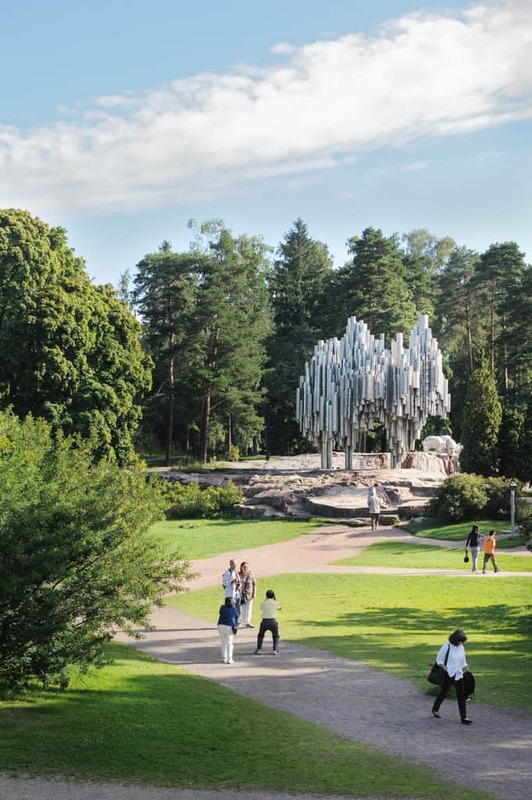 To experience the design legacy of famed Finnish architect and designer Alvar Aalto, I recommend a visit to the Alvar Aalto Museum. The Alvar Aalto Museum in Helsinki. 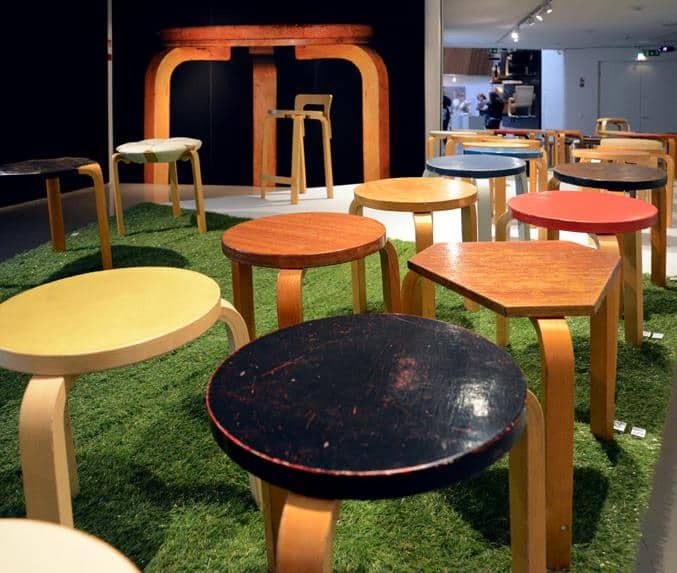 Modernist Architect and Designer Alvar Aalto’s iconic three-legged stools are on view at the Aalto Museum in Helsinki. 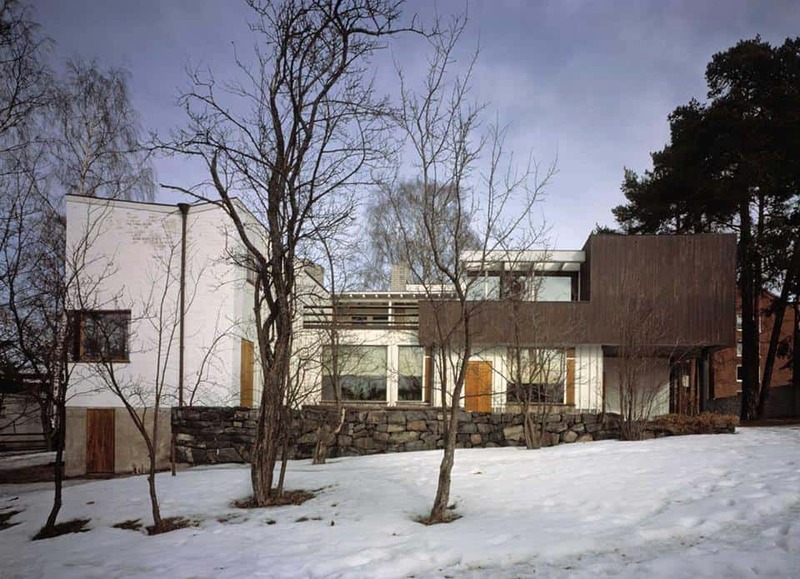 Tour his personal home, the Aalto House, also open to the public. Designed 1936 using simple uncluttered materials, the home doubled as a work studio until 1955, when he designed Studio Aalto to house his expanding practice, a short walk from his home. The studio is opened for public tours as well. Finnish Architect and Designer Alvar Aalto’s personal home in Helsinki is open for public tours. 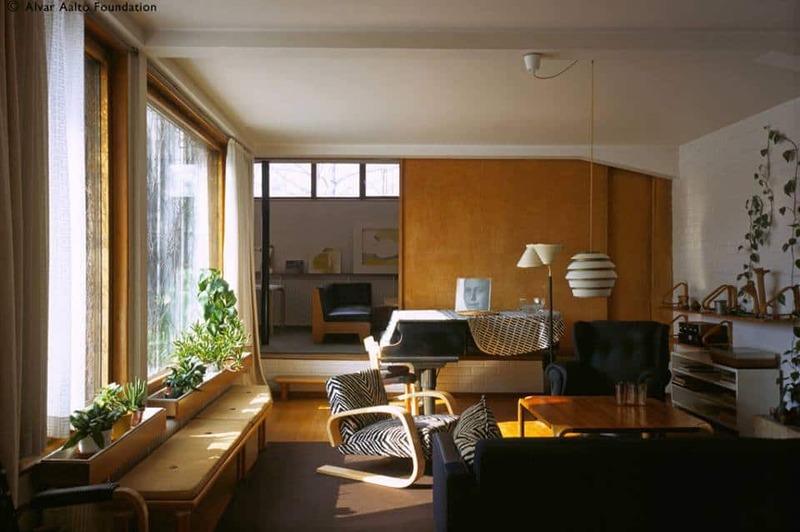 Interior of Modernist Architect Alvar Aalto’s personal home in Helsinki open for public tours. During the winter months, Helsinki sees about six to eight hours of daylight with the sun rising at 9 a.m.-ish and setting at 3 p.m.-ish. Taking advantage of longer nights, the city shines the light on art and culture with special events during those months. 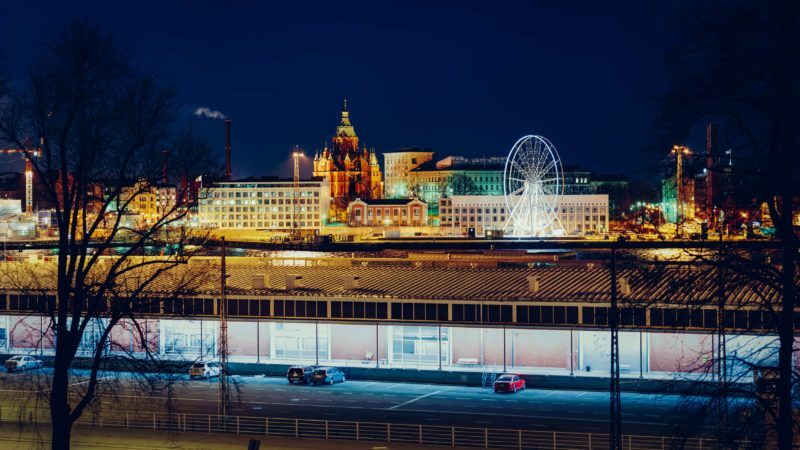 The Lux Helsinki Light Festival held in January illuminates the cityscape. 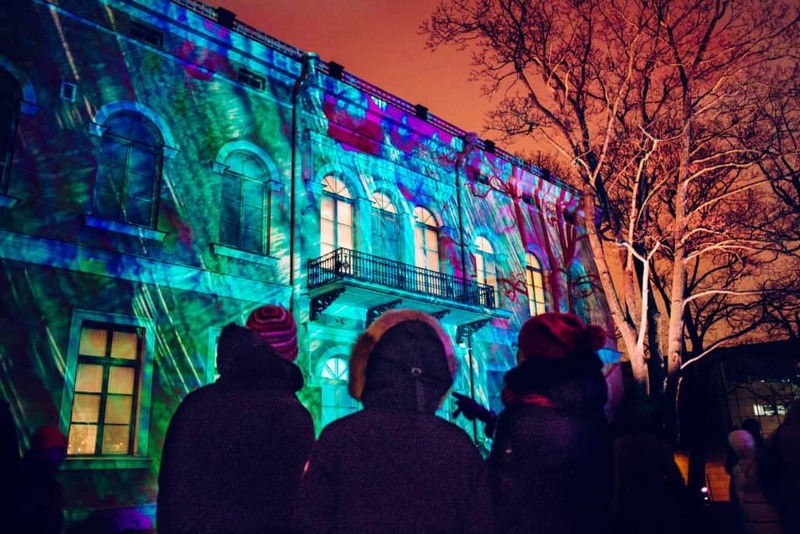 The Lux Helsinki light festival takes place in Jan. 6-10th in the city center featuring public installations of light art along the main route between the Market Square and the Kruununhaka district at the darkest time of the year. 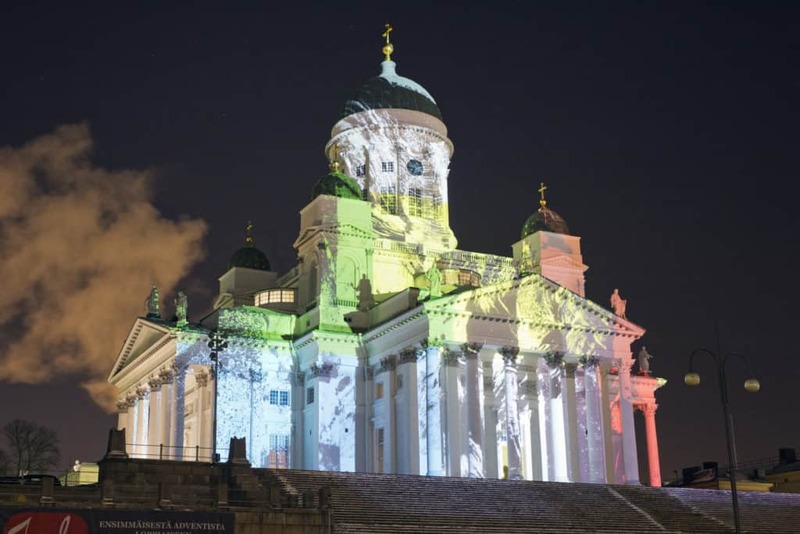 The Lux Helsinki Light Festival is a free, family-friendly festival that showcases the works of most exciting artists from Finland and all-around the world. 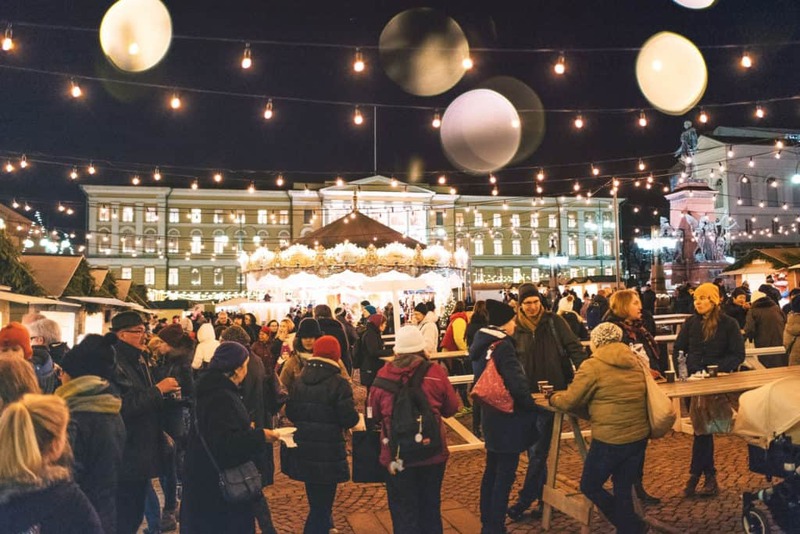 During the Christmas season, public spaces come alive with Helsinki’s many Christmas markets including one in Senate Square and a Christmas Festival at the Cable Factory. 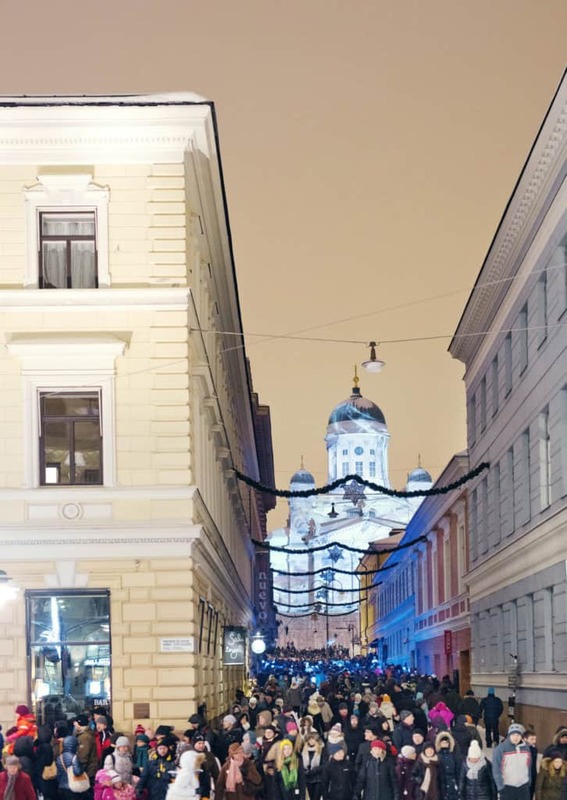 The holiday season kicks off at the end of November with the opening of the Christmas Street along Aleksanterinkatu. 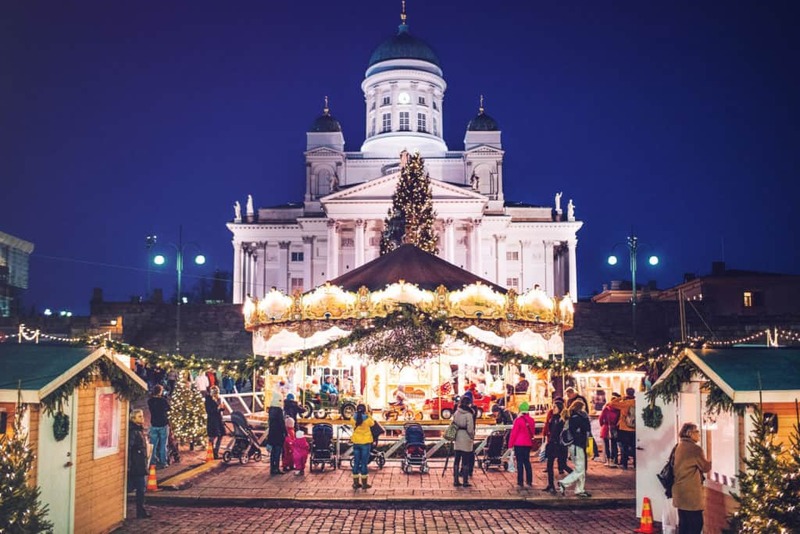 Helsinki Christmas Markets are a great way to discover artisan and handcrafted design items and experience the beautiful holiday lights. 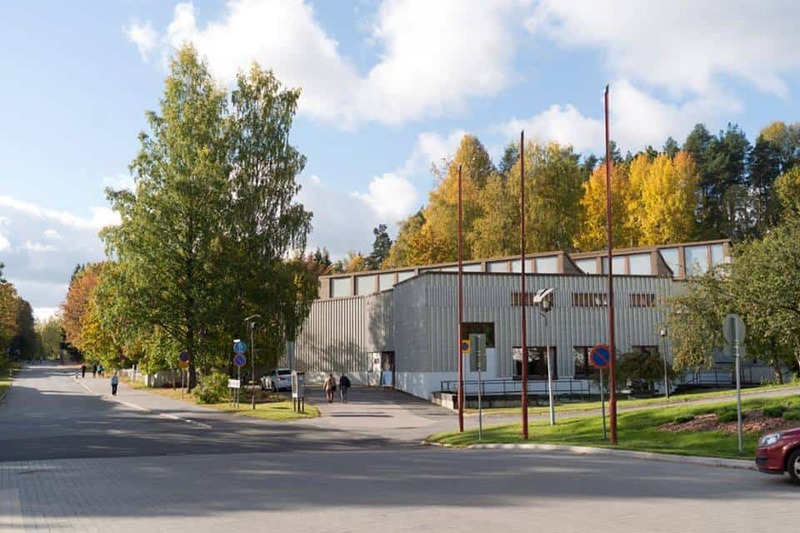 Sweat it out and appreciate the modernist architecture of the Löyly sauna, open to the public in the Hernesaari district on the southern tip of Helsinki. The eco-friendly, seaside complex includes a traditional Finnish smoke sauna, two other wood-heated saunas, a year-round terrace and a restaurant. The Löyly sauna on the Helsinki waterfront is open to the public and showcases organic, modern architecture. The Finns love to sweat and socialize in public and private saunas which explains why the country has more than 3 million saunas and 20 public saunas in Helsinki. An annual Sauna Day in Helsinki invites privately owned saunas to open their doors to the public held in March. 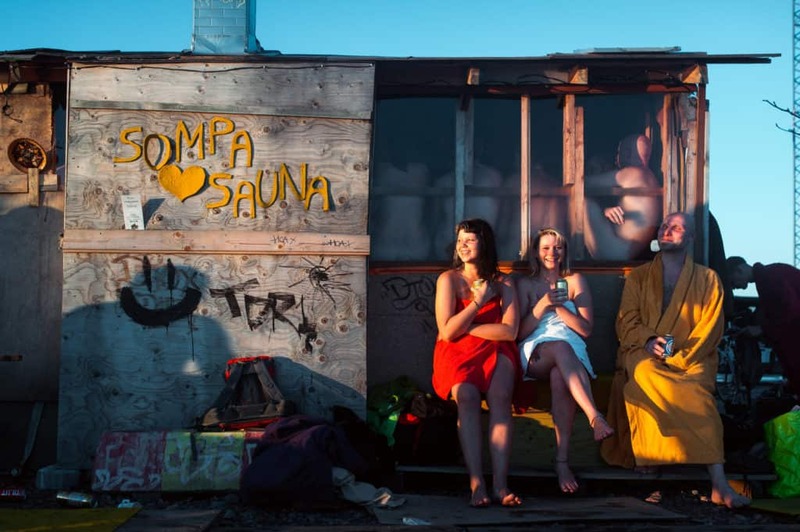 Helsinki Sauna Day is an event that opens the doors to the city’s saunas for everyone to enjoy. Next Helsinki Sauna Day will be held on March 10, 2018.